Another year of gorgeous, Insta-worthy moments is in the books! 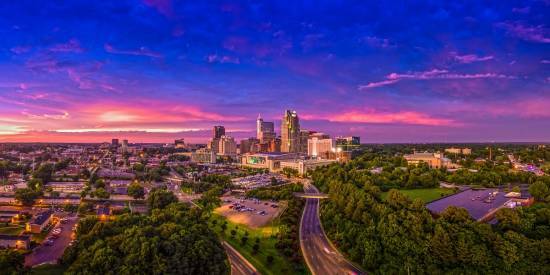 From beautiful sunsets to skyline views, incredible fall foliage to sunflower blooms, 2017 in Raleigh, N.C., was full of amazing #visitRaleigh captures (more than 20,000 photos with that hashtag have been uploaded to Instagram!). To celebrate, we&apos;ve rounded up 17 of the most loved photos that we posted to the platform in 2017. A huge "thank you" goes out to all of the visitors and locals who continue to make #visitRaleigh look better than ever across Instagram, Twitter and Facebook! If you&apos;re looking for spots around town that can help take your photo game to the next level, start by checking out our list of the most Instagrammed spots in the City of Oaks. 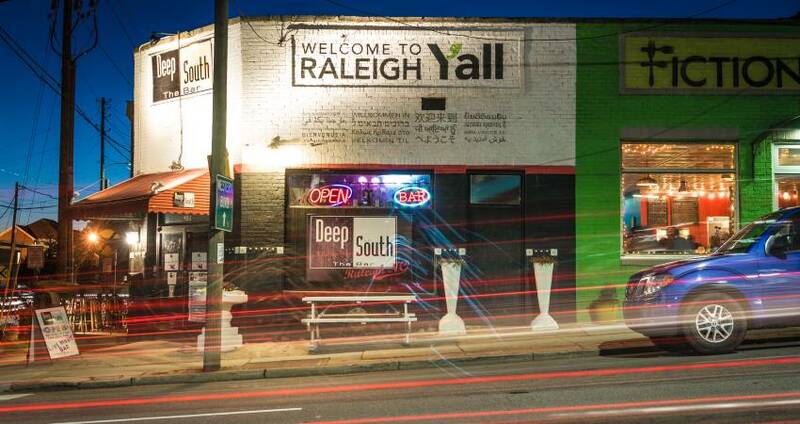 This "All Are Welcome Raleigh, N.C." mural, created by artist Luke Buchanan, instantly became one of the most popular photo spots in the Raleigh area upon its completion in spring of 2016. It&apos;s located right next door to chef Ashley Christensen&apos;s Poole&apos;s Diner. Established in 1887 and designated as the first public park in N.C., Pullen Park sits nestled between downtown Raleigh and the campus of North Carolina State University (NCSU). Known for terrific recreational opportunities, especially for kids and families, the park includes an operating carousel built in 1911, a miniature train you can ride through the park, pedal boats to move around Lake Howell, plus tennis courts, baseball and softball fields, an arts center and an innovative performing arts venue, Theatre In The Park (Ira David Wood III Pullen Park Theatre). Lake Raleigh—a relaxing getaway on NCSU&apos;s beautiful Centennial Campus (and just across from the incredible James B. Hunt Jr. Library)—shows off its fall colors in this photo taken in early Nov. The state&apos;s largest annual event, the N.C. State Fair drew more than a million visitors through the gates in Oct. to help celebrate its 150th anniversary in 2017. Eleven days of high-flying rides, deep-fried foods, live music, stunt shows and other entertainment (including nightly fireworks!) 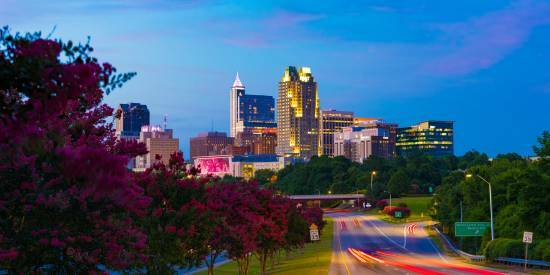 make this a can&apos;t-miss Raleigh experience. The 164-acre Ann and Jim Goodnight Museum Park at the North Carolina Museum of Art is truly a world-class outdoor space, filled with nearly 30 pieces of site-specific temporary and permanent works of art, including "Askew" by artist Roxy Paine—a 46-foot-tall stainless steel sculpture in the photo seen here. Who doesn&apos;t love a good aerial photo? This shot, overlooking Red Hat Amphitheater and the Raleigh skyline, gives a good look at the city&apos;s commitment to keeping plenty of greenery around. This hand-painted sign by Raleigh artist Sean Kernick, sitting outside of Deep South The Bar, says it all—Welcome to Raleigh, Y&apos;all! You&apos;ll find signs, stickers, posters and murals with these words (in 17 different languages) around town thanks to local non-profit group Come Out & Show Them. Seen here, The &apos;Works! July 4th on Fayetteville Street is a massive Independence Day celebration in downtown Raleigh with live music, hot dog-eating contests, BMX stunt shows and more until the grand finale of fireworks light up the sky at 9:30pm in two different locations (Red Hat Amphitheater, pictured, and in front of Duke Energy Center for the Performing Arts). There aren&apos;t many things better than a warm summer sunrise, as evidenced in this drone photo taken early in the morning overlooking the North Carolina State Capitol building. A Raleigh tradition for more than 70 years, the Raleigh Christmas Parade is the largest parade of its kind between Atlanta and Washington, D.C. The parade—filled with marching bands, dancers, classic cars, super heroes and more—marches through downtown Raleigh for two hours along a 1.4-mile route that draws a crowd of 60,000 spectators. You won&apos;t find many recipes better than putting coffee and murals together for an Instagram hotspot. At Sola Coffee Cafe, this new mural makes for the perfect photo opp (after grabbing a latte and some of Sola&apos;s famous hot mini donuts!). And speaking of hotspots, the Neuse River sunflower fields, only in full bloom for a two week period each year in early July, have drawn huge crowds in recent years as word got out about the nearly 50 acres of fields full of brilliant yellow flowers along the Neuse River Greenway Trail. Read up on how these fields are used for good here. One of everybody&apos;s favorite #visitRaleigh views, drivers entering downtown Raleigh from S. Saunders St. are greeted with an unimpeded view of the Raleigh skyline. Pictured here at sunset, Historic Yates Mill, the centerpiece of Historic Yates Mill County Park, is the last operable water-powered gristmill in the Raleigh area. Placed on the National Register of Historic Places in 1974, the mill is open for a variety of guided tours from March-Nov., where guide operators will proudly tell you about the rich history behind the mill&apos;s importance to the area. Fall colors, perfect weather and rocking chairs for two at Raleigh&apos;s Lake Johnson (a popular running, kayaking and fishing spot)—sign us up for more of this in 2018! 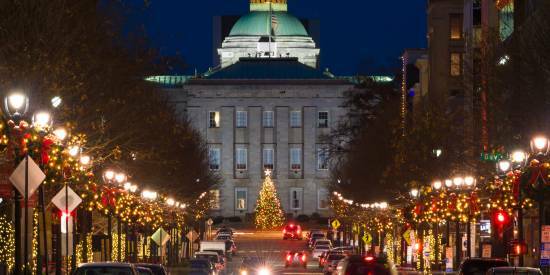 When the lights are turned on and the wreaths go up in downtown Raleigh, you know the holidays are on their way! Pictured straight ahead here, the Duke Energy Center for the Performing Arts plays host to a number of holiday arts productions that are annual Raleigh holiday traditions, including Carolina Ballet&apos;s The Nutcracker and Broadway Series South&apos;s rendition of Rudolph the Red-Nosed Reindeer: The Musical. Another holiday tradition, the North Carolina State Capitol tree-lighting adds a pop of color to the Capitol grounds each Dec. (and temporarily gives this life-size bronze statue of George Washington something to watch over! ).